So, do they have rehab for this kind of thing? 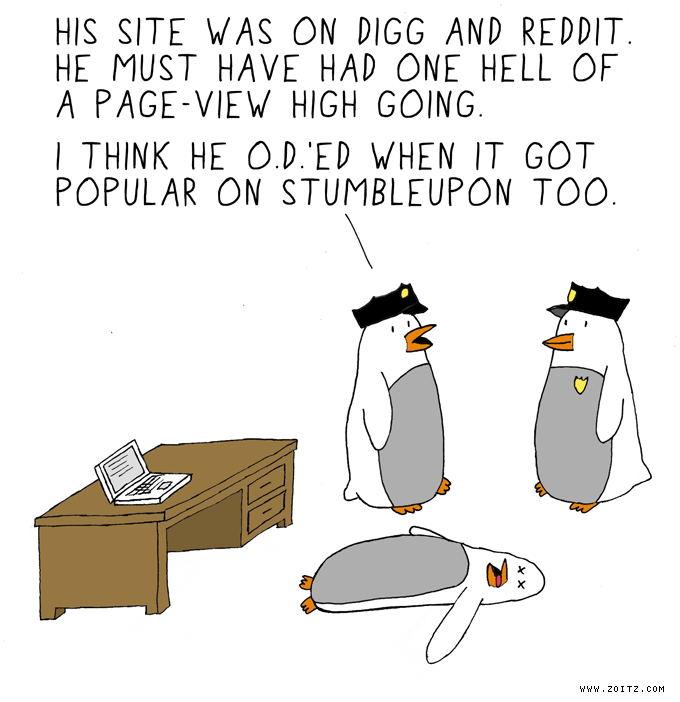 he hired an army of penguins to upvote his site until it reached the front page of Digg/Reddit. maybe he would have been saved if the government made this sort of thing illegal… Then he would just sit in jail and nobody would have to worry about figuring out how to fix the problem he had. I wish that I were that penguin (or that white and grey bird). penguins will save the world ! THINK LINUX! Stumbling causes insomnia and restlessness. It should be regulated and taxed at the very least. Then we could pretend the money was going to schools and rehabilitation programs but, in actuality would just line the pockets of the damn Stumbling Lobby in warshington. It’s a lose-lose situation. Its a pity a bird had to die senselessly to prove this point yet again. Lol, fantastic comedy on social bookmarking addiction. Anyone who thinks this is related to social bookmarking addiction doesn’t quite get the joke. Oh yeah. I nearly passed out in a pool of my own vomit when I saw that I had over 300 stumble hits in an hour once. The rest of my life has been a chase for that feeling again. Yeah, I don’t think a lot of the commenters understand this, but as a webmaster I certainly do!! Cool little cartoon. Very, very funny and oh so true. A Stumble for your efforts ! Took a while, but I finally got to experience that “page-view” high. But like Fingel mentioned above, coming down hurts. Here’s to the next one!